Made up of five picturesque towns on the Ligurian coast, Cinque Terre is Italy's answer to the French Riviera. Change things up with these side-trips from Cinque Terre: Monterosso al Mare (Footpath Monterosso - Vernazza & Convento dei Cappuccini e Chiesa di San Francesco) and Portovenere (in Porto Venere). Spend the 17th (Fri) exploring nature at Parco Nazionale Cinque Terre. There's lots more to do: take a stroll around Vernazza, don't miss a visit to Santuario di Soviore, tour the pleasant surroundings at Cinque Terre Trails, and take in the architecture and atmosphere at Santa Margherita di Antiochia Church. 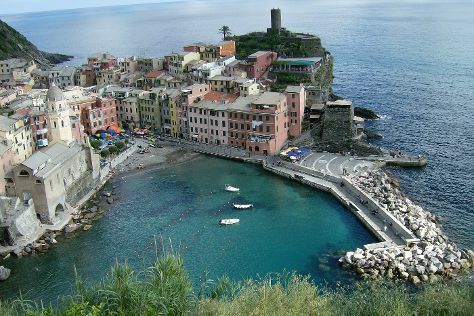 To find traveler tips, photos, ratings, and other tourist information, read our Cinque Terre online itinerary creator. The Route module shows you all the different ways you can get to Cinque Terre. March in Cinque Terre sees daily highs of 17°C and lows of 8°C at night. Wrap up your sightseeing on the 17th (Fri) early enough to travel back home.